Choose from 6 colours and a 7 digit number in the range 8000001 to 8499999. SIAC Active Card includes an elastic Finger Loop 14cm or Wristband 25cm. It holds 128 Punches. 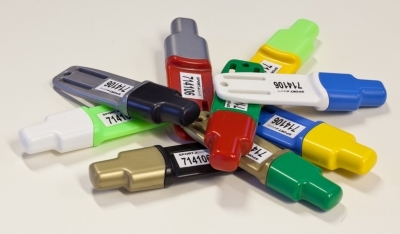 When timing data is written to the SIAC at a control, the translucent tip produces several vivid flashes and the SIAC makes several shrill beeps to confirm success. The SIAC has a 2 year warranty but the small internal battery does not have a warranty period. Battery life is up to 3 years and can be replaced by returning the card to SPORTident. The SIAC is used for almost all MTB Enduro events worldwide. It is perfect for ALL orienteering events and when used contactlessly, you only needs to pass within 0.5M of a control. The SIAC can also be used at events with Direct Punching where you dip it in the station, just like any other SI-Card. It usually takes about two weeks to deliver a personalised SI-Card. Please allow an extra week for deliveries outside the United Kingdom to other European countries and two extra weeks to countries outside Europe. 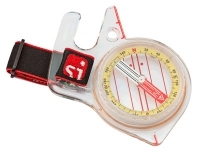 SIAC Active Card includes an elastic Finger Loop 14cm as standard for orienteering. If instead you would like a Wristband 25cm for MTB events or trail races, please specify this in Additional Information on the CHECKOUT page. SIAC Active Card available from stock is BLUE. It includes an elastic Finger Loop 14cm or Wristband 25cm. It holds 128 Punches. When timing data is written to the SIAC at a control, the translucent tip produces several vivid flashes and the SIAC makes several shrill beeps to confirm success. The SIAC has a 2 year warranty but the small internal battery does not have a warranty period. Battery life is up to 3 years and can be replaced by returning the card to SPORTident. Please allow two weeks for deliveries outside the United Kingdom to other European countries and three weeks to countries outside Europe. It is possible be that your SIAC was not switched on successfully at a recent event and the battery is fine. Before you purchase this item try to check your SIAC at an event by dipping it in a SIAC Battery Test Station. Please include your SIAC number and COLOUR in the 'Additional Information' box at checkout. SIACs should be sent to SPORTident UK Limited, Sleagill Head Farm, Sleagill, PENRITH, Cumbria, CA10 3HD. Please remove and keep any elastic attachments. The SIAC must be placed in a small padded envelope and if sending from the UK, use Large Letter Post or a tracked option. If you would like to discuss this, please email support@sportident.co.uk. Batteries do not come with a warranty. The SPORTident ComCard Pro combines two key items of equipment - a SPORTident card and Moscow Compass in a single, elegant thumb device. The chip is the same as for the SI-Card 10 with a 132 punch capacity (128 punches with time and control number, start time, clear time, check time, finish time). It stores a punch in 60ms, which is twice the speed of a ComCard Up. Four different compasses are available in the Northern Hemisphere - Stable, Rainbow-Stable, Super-Stable and Fast. Only the Stable and Rainbow-Stable are available in the Southern Hemisphere. WILL YOU MAINLY USE YOUR ComCard OUTSIDE EUROPE? Please add Additional Information on the Checkout page as the compass module is specific to your world region. It usually takes about two weeks to manufacture a ComCard Pro. Please allow an extra week for deliveries outside the United Kingdom. The SPORTident ComCard Up combines two key items of equipment - a SPORTident card and Moscow 11 Entry Level Compass in a single, elegant device. The chip is the same as for the SI-Card 8 with a 33 punch capacity (30 punches with time and control number, start time, check time, finish time). It usually takes about two weeks to manufacture a ComCard Up. Please allow an extra week for deliveries outside the United Kingdom. Please consider purchasing a SIAC instead - Can be used for all events (incuding Contactless), issues a shrill beep and a bright flash. Pick your own tip colour and a 7 digit number in the range 7000001 to 7999999. Third generation SI-Card, replaces the SI-Card 6, is nearly twice as fast as an SI-Card 8/9 making it nearly 6 times faster than an SI-Card 5. It has 132 punch capacity (128 punches with time and control number, start time, clear time, check time, finish time). It usually takes about two weeks to manufacture a personalised SI-Card. Please allow an extra week for deliveries outside the United Kingdom. Pick your own colours and a 7 digit number in the range 1000001 to 1999999. Reduce the cost of your new SI-Card by trading in your old SI-Card or Emit brikke.